The president of the United States has the whole world in his hands every time he bangs out 140 characters of anger, confusion, poor foreign policy or misspellings on Twitter. For almost nine months of his presidency, we’ve seen him try to start several wars, contradict himself daily and fling virtual poop at whoever has angered him in the previous 24 hours. 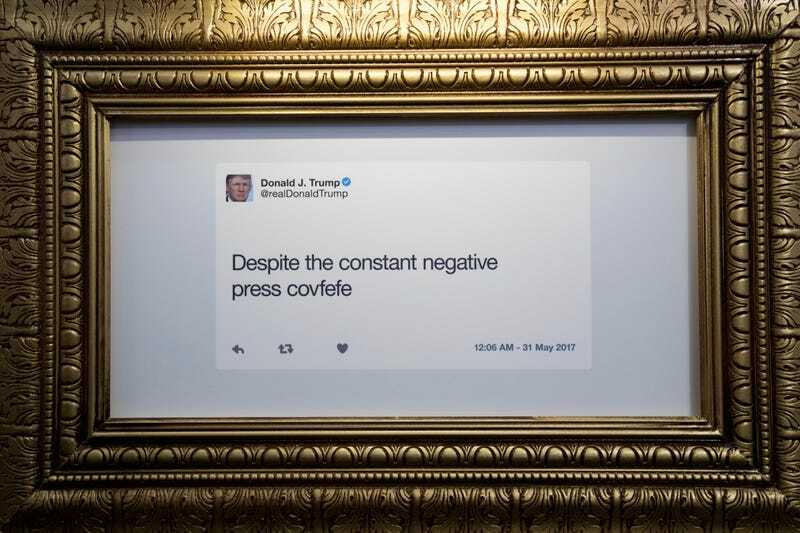 However, on Saturday, Americans were reminded not just of how shallow and petty President Donald Trump’s tweets are but also of how equally ugly his actual timeline is. Since we have no idea what Trump’s finances are, and since his federal budget proposal was shorter than a sitcom script, we can learn a lot from his Twitter timeline. And it turns out, it’s just as bad as anything he actually tweets. On Saturday, Dan Scavino, Trump’s social media director (who I’m sure has a big sign over his desk that says, “You have ONE job,” which he is routinely failing at), tweeted out a poll of which people Trump supporters think the president should be following, based on Twitter’s own recommendations. The fact that the president of the United States doesn’t follow his own party’s speaker of the House should be embarrassing to the GOP, but he doesn’t follow them, either, so I guess at least he’s consistent. One would think, though, that a competent social media director wouldn’t have to wait on a Twitter algorithm to tell the president to follow his co-workers. Which led me to take a look into whom Trump actually follows on Twitter in general. Considering how much time he spends on Twitter, the fact that he follows only about 45 people should scare the hell out of everyone, especially since we know he doesn’t read his security briefings unless there are bright pictures and everything is in Comic Sans. You can see the full list of whom Trump follows here. I decided to break down exactly what our president is consuming every morning on Twitter just to make sure I wasn’t overlooking anything and possibly painting a rosier picture of the commander in chief than I should. That didn’t help things. Trump spends most of his time following right-wing news from the Drudge Report, which is essentially Breitbart for baby boomers, to the talking heads on Fox & Friends. Next are political flunkies like Kellyanne Conway and even Reince Priebus, whom he got fired about a month ago. I guess no one should be surprised that Trump is still actively following, not one, but two former Fox News serial sexual harassers in Eric Bolling and Bill O’Reilly, while at the same time giving up some of his limited brain space to disgraced “journalists” like Geraldo Rivera and Piers Morgan. I was equally not surprised to see that Trump follows only two black people—not Ray Lewis, not Steve Harvey, not even Pastor Darrell Scott. Nope, he follows Katrina Pierson, who’s been dragged across CNN more times than the news ticker “Trump caught lying,” and Diamond and Silk, the black versions of Mimi from The Drew Carey Show. It’s going to take America at least another three years to delete Trump’s account, but the least he can do until then is show the world that his keyboard courage goes beyond subtweets.